Without any client capital investment or increased staffing requirement, we implement and operate preeminent screening 3D mammography (tomosynthesis) services within and for the benefit of OB/GYN practices and their patients. Through decades of experience, we know that OB/GYN patients appreciate the comfort, convenience, and discretion available to them through an in-office 3D mammography service offering. We also know that 3D mammography involves many decisions beyond simply selecting a manufacturer with the best price. You must anticipate solutions for workflow, equipment, IT, staffing, maintenance, image management, interpretation, compliance and so much more. ONsite Mammography is the preeminent developer and operator of 3D mammography services within the OB/GYN profession. We offer a comprehensive portfolio of project management, installation, and operational services that eliminate the administrative burden to providers and staff, thereby allowing them to remain focused on the delivery of quality patient care which can now include 3D mammography. We do this without any client capital investment or increased staffing requirement. We will provide a practice-specific financial pro forma that will allow you to assess the value proposition and opportunity offered by ONsite. We continuously update Medicare reimbursement rates and other key financial data to insure that any financial profile provided is current and accurate. Simply submit the following information and someone from our team will contact you shortly to explain the features and direct benefits of our service platform and explore the opportunity of working together. As printed in the June issue of OBG Management magazine. Thus, fear of breast cancer is a very important health concern for many women. As gynecologists and health care providers who concentrate on women’s health, we are the frontline clinicians tasked with maximizing . . Recent guideline updates from the American Cancer Society and the US Preventive Services Task Force (USPSTF) have unfortunately misled. . .
Tomosynthesis: What is it, and are all systems equal? Digital breast tomosynthesis offers cross-sectional imaging of thin sections of the breast. Although 2-dimensional (2D) screening mammography is proven to reduce. . . 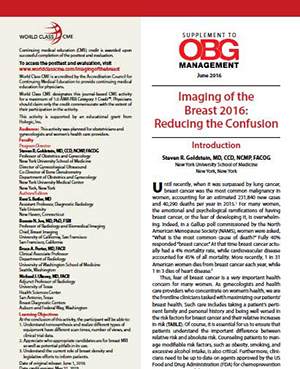 Dense breast screening: Ultrasound, tomosynthesis, or MRI? Recent legislation has propelled the issue of mammographic breast density to the forefront of public attention. Currently, 24 states have breast density reporting laws, and last year a bill titled, the “Breast Density and Mammography . . . Accepted indications for magnetic resonance imaging (MRI) of the breast in high-risk breast cancer (BRCA) surveillance are evolving, variable, and often disputed. Although MRI is not indicated in women at average risk . . .
ONsite Mammography continues to innovate in a field we created. ONsite works with some of the finest Board-certified radiologists in the country. All are experienced breast image interpreters with established, impressive professional reputations. Accordingly, they are some of the most experienced interpreters of 2D mammography exams and, as it becomes more prevalent, 3D mammography studies in the United States. We are proud that one radiologist is hailed as a luminary in 3D mammography interpretation, having been a co-author of the landmark 2014 3D mammography study published in the Journal of the American Medical Association (JAMA). We are pleased to profile one such radiologist – Debra S. Copit, M.D. – and will include more over time. What guidelines does ONsite subscribe to regarding patient age and frequency of screening mammography? ONsite has maintained, for years, and still maintains the position that all women 40 years of age and older should receive an annual screening mammogram. Women below the age of 40 with an increased risk of breast cancer (i.e. family history) should also receive an annual screening mammogram. Is 3D mammography (tomosynthesis or digital breast tomosynthesis) reimbursed? Effective January 1, 2015, the Centers for Medicare and Medicaid Services (CMS or Medicare) commenced reimbursement for 3D mammograms. Commercial insurance companies have been slow to respond on this topic, but we expect they will eventually reimburse for 3D as they did when the industry transitioned from analog to digital mammography. It is important to note that several states (Illinois, Pennsylvania, and Connecticut) have enacted legislation that mandates coverage of 3D mammograms for residents of those states. In practical terms, how is 3D mammography trending in the marketplace? 3D mammography is becoming more widely used with each passing day. Radiologists who interpret 3D mammograms on a daily basis bear witness to its clinical superiority. Women, the direct benefactors of 3D mammography, are becoming more educated about its benefits and, in an era of healthcare self-advocacy, are demanding access to this life-saving technology. ONsite and many others serving the women’s healthcare industry believe it is just a matter of time before all commercial insurance companies agree to reimburse 3D mammography. They will do so as a result of the volume of clinical evidence and/or pressure brought to bear upon them by women who simply believe they should be afforded access to the very best commercially available technology. What is ONsite's position on 3D mammography? We believe every woman, not just Medicare enrollees, should have access to the very best technology that will detect breast cancer at its earliest stage. All women are entitled to nothing less. Accordingly, we advocate for 3D mammography and continue our efforts to transition all of our client practices from digital mammography to 3D mammography. How does the 3D payment portion work if our commercial carriers aren’t reimbursing yet? When commercial carriers are not yet reimbursing, it is common for practices to collect an additional fee from each patient who received a 3D mammogram. This is typically in the range of $50-75 per patient. Based on what our various client practices tell us, patients are quite willing to pay the additional fee for the peace of mind that comes from having access to this state-of-the-art technology. Who does the radiological interpretation? ONsite contracts with Board-certified radiologists who specialize in breast imaging. Accordingly, they are some the most skilled and experienced interpreters of 2D mammography exams and 3D mammography studies. Each radiologist reads images from assigned client locations which they access through a secure and proprietary technology platform. A physician report for each interpreted exam is generated and transmitted back to the respective OB/GYN client for EHR filing purposes. A patient “plain-language” report (required by regulation) is also generated and mailed to each patient’s home address. What if we’re on a hospital property? In most situations, this is not an issue. When it has become a challenge, ONsite has worked with the client practice to achieve a favorable outcome. We encourage you to contact us to explore this topic more fully. We don’t do mammo now so how will I find out what my reimbursements are? You should first review your contracts with each of your carriers. We will be happy to provide you with the billing codes you would use for delivery of mammography services through your practice. Thereafter, you should determine with each carrier its 3D reimbursement total. This is, most often, a brief iterative process, and ONsite will be happy to provide guidance.